The position of the Moon in Capricorn speaks of a prudent, attentive and persistent nature. Man with the Moon in Capricorn is distinguished by diligence, perseverance, ambition; in all that he does, is extremely collected, accurate and cautious. Lunar Capricorn in the negative - this embodied suspiciousness, selfishness, secrecy, indecision. Poor upbringing and just a depressed mood are the two main factors that form the negative. In this case, Capricorn is prone to frequent depressions, is subject to stress and badly copes with them, pathologically fears failures, is not sure of its future, we are tormented by various doubts and fears. In this version, caution grows into a pathological fear of loss and error. As a result, a person is reinsured twenty times and receives nothing, because he has time to miss the right moment and lose all opportunities. He is secretive, does not go to full frankness even with friends, is not inclined to stormy feelings and the more vivid manifestations of his emotions. But the lunar Capricorn in a positive, with a harmonious mental state and good upbringing is a conscientious intellectual, very responsible, constant. If many other lunar signs are distinguished by intuition, the trump card of the lunar Capricorn is logic. This is a real pragmatist. He hates empty conversations, reflections and dreams: either he will immediately get down to business, or at all will not think about it. Shaking of air and air locks are not for lunar Capricorn. This is a realist, he looks at the world objectively, adequately assessing what is happening. As a rule, his assessment is accurate, and the conclusion is undeniable: he does not base his opinion on a momentary impression or suspicion, but on the basis of subtle analysis. Work . In work, the lunar Capricorn is persistent, responsible, diligent, accurate, patient. He is a great diplomat, he knows how to negotiate, bargain, find compromises, persuade, convince. Has an innate sense of tact. He considers money well. Thanks to such invaluable qualities, the lunar Capricorn has every chance to make an enviable career. Very often he chooses a profession once and for all, he can change jobs, but he does not like to change the field of activity, he does it very rarely, at most 2-3 times in his life. He needs a job that interests him, and he finds this specialty. Lunar Capricorn is a person of the system, so he is well able to work related to logical thinking. For him the structure of the firm in which he works is important, from the very first day he must know his immediate superior - and will obey only him. If he himself becomes a boss, the subordinates can forget about what familiarity is: the hierarchy will be very tough. Like discipline. But in many respects the subordinates are lucky, because he is an excellent organizer, under his leadership they will grow faster as specialists. Career . Secretly, each lunar Capricorn wants to be the boss, because he is ambitious, and even better - a famous person, because he wants to be famous and popular. This is something he rarely confesses to himself, but it would be worth it: these are excellent qualities for a careerist, without them it is impossible to achieve serious results. In all areas, the lunar Capricorn strives for success - for him this is the most important indicator of the quality of life. But he's not one of those who want to break free. He needs to do everything, otherwise he will lose respect for himself, and his success will cease to be really valuable for him. The house . In everyday life the lunar Capricorn requires cleanliness and frugality. Note that the purity in this case is not the same as the order. Unlike the lunar Cancer, who wants everything to shine and lie in place, or the lunar Sagittarius, which is important - remember where everything is, lunar Capricorn looks at life easier. He needs to find the object where he left - more is not required. Even if there are blockages in the house, he will find in them the thing necessary to him. If only there was no dust on the furniture, dirt on the floor and unwashed dishes in the sink. At the same time he is unpretentious, able to confine himself to the most necessary. It is irreplaceable in campaigns, expeditions and other cases, where everyday life is considerably complicated. In any difficult situation - even though on the road, even in a financial crisis - it will not go out of your way to create maximum comfort - rather, it will limit your desires and / or expenses. Often this is quite enough. Relationships . In a romantic relationship, the lunar Capricorn is not always as lucky as in business life. He is able to be very emotional, albeit restrained in the manifestation of feelings. But if he does not show them, this does not mean that they are not: they can be very strong, just this person does not show what he thinks belongs only to him. Therefore, he does not like intimate conversations with little-known people. In addition, the lunar Capricorn is valuable for the partner in that it can perfectly behave in the hands. He does not like conflicts, he does not break off at his relatives. He is disciplined, you can come to an agreement with him. He does not like to cry, he prefers to solve the problem. Aspirations . A very characteristic feature of the personality of the lunar Capricorn is the striving for perfection. He understands this as a high standard. Unlike some other lunar signs, for him it is not at all humiliating to be equal to anyone. He always strives to conquer new peaks, constantly improves himself as a person, as a professional. In addition, for him the social status is very important. The main emotional problem of lunar Capricorn is the inability to find psychological relaxation. Due to its secrecy and restraint, the lunar Capricorn is very heavy on the manifestation of feelings - both bad and good. As a result, he has emotional stagnation. All the bad things that happen to him, he experiences extremely painful. Therefore, it often lies in wait for stress, to find a way out of which it can not. As a consequence, the negative energy in it stagnates, giving rise to disappointment and even despair. This is difficult, unpleasant and, in the end, leads to the formation of the negative, which we outlined above. Using his unprecedented patience and persistence, the lunar Capricorn could fold mountains. But often he lacks internal energy. Therefore, we need to look for its sources if not in ourselves, then in the surrounding environment. Disease of bones, joints and skin. Magic for career, political issues. When you find the full moon in Capricorn, you can be fortunate in connection with promotion, especially in terms of achieving success or climbing to the top of the service ladder. 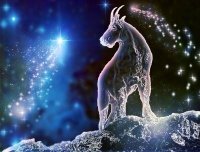 Capricorn can be very ambitious, so his energy can spur careerist aspirations. Time perfectly suits to overcome any difficulties, clearing the path to success.